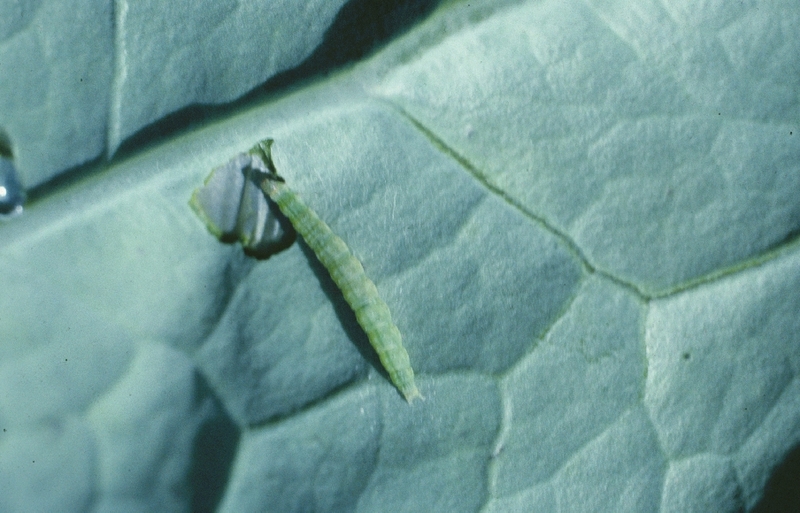 Diamondback moth is a pest of all brassica crops and is present throughout the growing season. Diamondback moth feeds on all plant foliage, rather than concentrating its feeding in the head like imported cabbageworm. Diamondback moth adults are the smallest of the brassica lepidopteran pests (<1/2 inch), light brown with a yellow diamond-shaped marking, and rest with their wings folded together like a tent. Caterpillars reach 3/4 inch in length, are light green, and are segmented and pointed at both ends. When disturbed they wiggle vigorously and may drop off the plant on a string of silk. Feeding causes small, round holes and tends to be spread across the foliage rather than concentrated in the head. Scout fields by checking leaves (underside) on 25 plants across the field. In the Northeast, there is generally no need to treat young plants unless weather conditions delay plant development and at least 35% of them are infested with any of these pests. Treat plants between the start of heading and harvest if 20% or more of the plants are infested. The most critical time to scout and apply controls is just prior to head formation. Use a 10-15% threshold throughout the season for kale, collards and mustard. Incorporate crop residues shortly after harvest to reduce movement to successive plantings and reduce overwintering populations. Use selective materials or microbial products to spare beneficial insects that help control aphids, DBM and ICW populations. Do not use less than 50 gal spray material/A; higher volumes provide better coverage. Better coverage of lower leaf surfaces can be achieved by using drop nozzles. Use a spreader-sticker. Diamondback moth has become resistant to many synthetic and microbial insecticides. Even if you are getting excellent control of this pest with the materials presently being used, you should alternate between effective materials to retard development of resistance. Newer materials and the aizawai strain of Bacillus thuringiensis will usually provide better control of resistant DBM than older products. Use transplants grown in New England to avoid importing DBM that have already developed resistance to one or more classes of insecticides.